The Nikon 1 series of camera was released in October of 2011, marking the company's entry into mirrorless interchangeable lens cameras. The camera uses a new proprietary lens mount, and three lenses were released at the camera's launch: the Nikon 10-30mm ƒ/3.5-5.6 VR is the kit lens that is sold with either the J1 or V1 camera. Combined with the CX sensor of the 1 series camera, which produces a 2.7x ''crop factor'', the 10-30mm lens offers a 27-81mm equivalent field of view. The Nikon 10-30mm ƒ/3.5-5.6 VR takes 40.5mm filters, ships as standard with the Nikon J1 or V1 body. It takes the optional HB-N101 circular lens hood. The Nikon 10-30mm ƒ/3.5-5.6 produced some excellent results for sharpness, slightly more at the wider end of its focal range than at telephoto. At 10mm and ƒ/3.5, images produced are very sharp indeed, and there's only a marginal gain by stopping down to ƒ/4: stopping down to ƒ/5.6, images produced are sharp from corner to corner. Stopping down further introduces diffraction limiting, but the results aren't really apparent until ƒ/16, where there is some very light softness across the frame. Between 14mm and 24mm the lens produces excellently sharp images, even at its widest apertures. Stopping down to ƒ/5.6 or ƒ/8 and your images are tack-sharp, though diffraction limiting starts in by ƒ/11; as above, it's not really apparent in any loss of sharpness until ƒ/16. At 30mm there is a very slight impact on overall image sharpness; images are still very sharp, with a sweeter spot in the center and just lightly soft corners. Stopping down to ƒ/8 produces a very slight improvement, but by ƒ/11 it's lost with the impact of diffraction limiting. The only focal length that sees any corner shading is 10mm; no amount of stopping down will completely remove it, but its maximum impact shows up at ƒ/3.5, where the extreme corners are just over a half-stop darker than the center. As the lens is stopped down this dissipates slightly, until it nears a quarter-stop differential by ƒ/5.6. At other focal lengths there is no corner shading to speak of. The Nikon 10-30mm ƒ/3.5-5.6 VR offers better results for distortion than you might expect for a kit lens: the typical barrel distortion that occurs at wide angle, but this distortion disappears gracefully as the lens is zoomed in to 30mm, where it reaches a point of parity and no distortion is visible. The Nikon 10-30mm ƒ/3.5-5.6 focuses very fast and near-silently, taking less than a second to focus from infinity to close-focus. Point to point focusing is a bit faster - more so at the wider angle than at telephoto. It's worth noting at this point that there is no manual focusing ring - it's possible to focus manually, but that's done via a camera control. Magnification is only 0.21x, and minimum close-focusing distance is 20cm (around eight inches), providing mediocre performance for macro work. The Nikon 10-30mm ƒ/3.5-5.6 VR is a small zoom lens, mating very nicely with our J1 test body and providing a stable, if small and light, shooting platform. The lens is available in five colors: red, white, silver, black and pink. Our sample was the fashionable glossy white version. The only control on this lens is the retractable lens lock switch; pressing this button and turning the zoom ring extends the lens for use, as well as turning on the camera. For a kit lens, the design is fairly substantial: 12 elements in 9 groups, including 3 Aspherical elements. The lens also features seven rounded diaphragm blades to make up the aperture. The 10-100mm offers similar quality, but much greater telephoto performance, at a significantly high price point and size. It doesn't balance quite as well as the 10-30mm, but for the versatility you get (it offers an equivalent 270mm maximum focal length) the compromise is acceptable. Technically, with the Nikon FT1 adapter, you should be able to mount this DX lens on the J1 or V1, and obtain an equivalent 27-65mm field of view. The 10-24mm tested quite well on the D300s body, so mounting it on the J1 or V1, which would crop out any problematic corners might make it an excellent lens there as well. The Nikon 10-30mm ƒ/3.5-5.6 VR really surprised us - for its small size and weight, it produces excellent photographs. If you're interested in buying a Nikon J1 or V1, this is the lens that comes with it, so it's nice to know that right out of the gate you will have a good lens to shoot with. The Absolute Biggest Pile of Junk in Photography. Junk lenses made in China. I am being 100% Honest. I am literally on my 5th Lens. This last one only lasted me 5 months. LENS ERROR Contact Nikon my screen says. So I contact Nikon. They did nothing for me. Nothing. I will never ever in my whole life ever buy another Nikon product! Yes, its seemed to be a decent lens. No distorsion, no corner shading, no evident optical weaknesses. Acceptable build quality. Still, you do not even know what your camera (in my case, Nikon 1 V1) is capable until you try it with a better lens (in my case, a 6.5-13mm). It is good, but not great. I have two of these lenses. Both black. They were bought with my Nikon Red J1 and Black J2. Both lenses are ultra-sharp and so accurate and tactile to use. Sheer perfection. The zoom ring is perfectly sized. 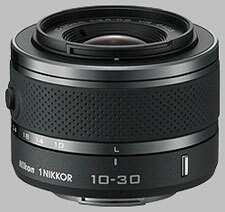 The black version of this lens is the best buy as it looks great with all of the Nikon 1 body colours. Great kit lens, if a bit large. Great performance for the price, much like the DX 18-55 VR DX.